Johann Hauser is among the artists associated with the Gugging group. "Gugging" is the abbreviated way of referring to the Haus der Künstler (House of Artists) established in 1981 by the psychiatrist Leo Navratil at the Lower Austrian Psychiatric Hospital in the hamlet of Gugging, outside Vienna. Many years earlier, Navratil had noticed that the art produced by several of his patients far transcended the qualitative parameters of traditional art therapy. These artists, selected by Navratil with advice from local museum officials and artists (including the well-known painter Arnulf Rainer), began to publicly exhibit in the 1970s. Gradually, the Haus der Künstler was supplemented by other facilities on the hospital grounds, including a studio, lecture hall, sales gallery, gift shop and museum. Today, under the leadership of the psychiatrist and artist Johann Feilacher, this complex functions under the name Art/Brut Center Gugging. The Lower Austrian Psychiatric Hospital was closed in 2007 and replaced by the Institute of Science and Technology Austria, an international research center. 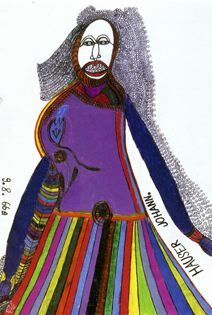 Predating the recent fad for "outsider" art, the Gugging colony has exhibited throughout Europe, the United States, and Japan. It is widely recognized for its pioneering integrity and quality. Johann Hauser was born in Bratislava and began to draw in his late twenties at the Haus der Künstler in Gugging. Hauser created powerfully saturated crayon and pencil drawings and is especially known for his demonic female nudes. Considered one of the most important of the Gugging artists, Hauser created the blue star that serves as the logo of the Haus der Künstler. His works have been shown since the early 1970s throughout Europe, and more recently at international venues such as the Los Angeles County Museum of Art, The Setagaya Art Museum, Tokyo, and the Neues Museum Weserburg, Bremen.